Americas gateway to the universe. Leading the world in preparing and launching missions to Earth and beyond. Page 2  Recognizing Our People  Deputy Director Jim Kennedy welcomed to KSC. Page 3      National Space Club honors and QASAR awards. Pages 4-5      Environmental remediation event.. Page 7      BCC biology course features KSC collaboration. Page 8      Apollo 13 IMAX premiere at KSC. 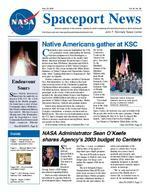 Nov. 29, 2002John F. Kennedy Space CenterSpaceport Newshttp://www-pao.ksc.nasa.gov/kscpao/snews/snewstoc.htmVol. 41, No. 24 Inside Endeavour SoarsNative Americans gather at KSCCelebration and ceremony highlighted the STS113 prelaunch events surrounding the historic mission assignment of John Herrington, a tribally enrolled Chickasaw who is the worlds first Native American astronaut. Kennedy Space Center hosted more than 350 Native Americans and NASA and contractor employees at KSC Visitor Complex, Nov. 9 and 10. The events included the White House Initiative on Tribal Colleges and Universities Symposium, titled Linking Education to Employment that took place in Orlando. Invited conference attendees included Chickasaw Gov. Bill Anoatubby, Lt. Gov. Jefferson Keel and other noted members of the Chickasaw Legislature. Chickasaw Elders and relatives, comprising nearly 200 tribal members, arrived by bus from Oklahoma to participate in the events. Other noted attendees included the American Indian Science and Engineering Society (AISES) Elders and officers, as well as presidents of Tribal Colleges and Universities, Native American educators, students and program leaders. Guests were transported from the conference location to KSC for tours of the Center and Visitor Complex, orientations, a mission overview and an IMAX movie. They also received information about the U.S. Space Program and educational outreach efforts to increase employment among Native American peoples in those areas. A welcoming ceremony was celebrated Nov. 9 at the Debus Conference Center in the Visitor Complex. Preceded by the Mandaree Singers of the Mandan/ Hidatsu tribe from North Dakota, the Seminole Color Guard of the Seminole Tribe of Florida presented Colors at the honorarium. On behalf of everyone here at the John F. Kennedy Space Center, we welcome you, and on behalf of all the people who work on the space program, I thank you for taking the time to be here to support this launch, said Center Director Roy Bridges Jr. Lee Frazier, a Chickasaw Tribal Elder, led the (See NATIVE, Page 6) (See MISSION, Page 8)NASA Administrator Sean OKeefe shares Agencys 2003 budget to CentersSean OKeefe (left) addressed NASA Centers Nov. 21 via NASA Television to discuss President George Bushs 2003 budget amendment regarding NASA. Bush recently submitted the amendment to expedite NASAs new Integrated Space Transportation Plan  a new, coordinated shift in three of the agencys important space flight programs. The new ISTP reflects important changes to NASAs five-year budget plan, but keeps costs within the original 2003 fiscal budget. The new Integrated Space Transportation Plan (ISTP) dedicates more resources to the International Space Station program, provides additional funding to extend the life and enhance the safety and reliability of the agencys orbiter fleet, boosts funding for science-based payloads and research, and restructures NASAs Space Launch Initiative (SLI), which was originally designed to identify next-generation reusable launch vehicle technology. Weve only used about 25 percent of the Shuttle fleets service life, so it makes sense to invest in the maintaining and (See BUDGET, Page 7)Space Shuttle Endeavour blazed into the night sky on mission STS-113, the 112th flight in the Shuttle program. On board were a crew of four: Commander James Wetherbee, Pilot Paul Lockhart and Mission Specialists Michael-Lopez Alegria and John Herrington; plus the Expedition 6 crew: Commander Ken Bowersox and flight engineers Nikolai Seminole Native American Veterans serve as color guard during a prelaunch Native American ceremony. SPACEPORT NEWS Page 3 Nov. 29, 2002The National Space Club Florida Committee recognized three outstanding members of the communications community with Harry Kolcum awards at the clubs monthly luncheon Nov. 12. The honorees were Lisa Malone, Lt. Col. Michael Rein and Pat Duggins. Each year the committee recognizes area representatives of the news media and communications professions for excellence in their ability to communicate the space story along Floridas Space Coast and throughout the world. The award is named in honor of Harry Kolcum, the former managing editor of Aviation Week & Space Technology who was Cape bureau chief from 1980 to 1993 prior to his death in 1994. Kolcum was a founding member of the National Space Club Florida Committee. Lisa Malone (right) is the associate director of the External Relations and Busi-ness Development Directorate at the Kennedy Space Center. Originally from Mobile, Ala., Malone joined NASA in May 1984. She is being recognized for her dedication and enthusiasm in sharing the NASA story with the general public, not only as the first female Voice of NASA, but alsoNational Space Club honors excellence in communicating about space as a Shuttle role model within the space community. Lt. Col. Michael Rein (right) is the public affairs chief for the 45th Space Wing headquartered at Patrick Air Force Base. Originally from San Antonio, Texas, he began service in the Air Force in May 1986 and was stationed at the Cape beginning in June 2001. Rein is being recognized for his outstanding efforts following the Sept. 11, 2001, attack on America to keep an open line of communication between the Wing and the public. Pat Duggins (right) is news director of Orlando public radio station WMFE-FM and is considered National Public Radios resident NASA expert. Originally from Camp Springs, Md., Duggins began his broadcast career in April 1984. His nationally broadcast space reports reach an audience of three million listeners. He is being recognized for his commitment to presenting space news in a fair and balanced manner.Five NASA and contractor employees of Kennedy Space Center were honored this quarter with the Quality And Safety Achievement Recognition (QASAR) Award. The QASAR recognizes individuals who have displayed exemplary performance in contributing products and services and a safe environment and processes for NASA. The honorees are as follows: Charles Davis  Boeing, selected for consistent dedication to Quality and Safety in the design and use of Orbiter Ground Support Equipment. Alan Markham  Creative Management Technology Inc., selected for leadership of the employee-led Safety Committee for the SGS Facilities Management Services Directorate, which has sustained a record of excellence to include significantly reduced accident rates. His professionalism and dedication to safety reflect great credit on himself and the Kennedy Space Center. Mark Page  NASA, selected for demonstrating exceptional performance in improving the quality of security for KSC Information Technology (IT) systems in support of NASA Headquarters and Kennedy Space Centers Security Campaign. Florence Patten  NASA, selected for exemplary performance, tireless efforts, and customer-focused contributions to the Kennedy Space Centers Safety and Mission Assurance Community, to help improve the Safety Program at KSC. Keith Pierce  Boeing, selected for dedication to continuous process improvements and the safety of the Manned Space Flight Program. The QASAR Award is sponsored by NASA Headquarters Office of Safety and Mission Assurance. The director of KSCs Safety, Health and Independent Assessment Directorate makes the final selection of QASAR recipients at the space center.Quality and safety basis of QASAR awardsCombined Federal Campaign Sets Another All-time Giving RecordNASA employees at KSC set another all-time giving record during their recently concluded Combined Federal Campaign. During this years CFC, 79 percent of the Federal employees at KSC generously contributed more than $306,000, far exceeding the Campaign goal of $265,000. Of that amount, $115,000 will be distributed to local charities in Brevard County. The Combined Federal Campaign is the annual solicitation of employees in the Federal workplace on behalf of local, national and international charitable organizations. NASA employees will celebrate on Dec. 11 the highly successful Campaign as part of the KSC Holiday Celebration. Page 5 SPACEPORT NEWS Nov. 29, 2002 inte rests groups beyond space program inte rests groups beyond space program inte rests groups beyond space program inte rests groups beyond space program inte rests groups beyond space programEnvironmental Remediation Tour and DemoThousands of sites across the world face problems with DNAPL contamination. The EPA has reported that DNAPLs are present at 60 to 70 percent of all sites on the Superfund National Priorities List. DNAPL contamination sites may include those created by dye and paint manufacturers, dry cleaners, chemical manufacturers, metal cleaning and degreasing facilities, leathertanning manufacturers, adhesive and aerosol manufacturers and government facilities. (Clockwise from upper left, page 6)  New methods of environmental cleanup are explained to government and business representatives, scientists and engineers during a presentation at Launch Complex 34-A, Cape Canaveral Spaceport. Making the presentations are Mike Annable with the University of Florida; Megan Gaberell with Battelle Memorial Institute; UCF Environmental Chemistry professor Dr. Cherie Geiger; Dr. Jackie Quinn, the NASA environmental engineer who heads the project; and Laura Filipek, a University of Central Florida graduate chemistry student involved in the science. Lower left, a touring group of national and international participants look over some Precision Sampling's drilling rig, new equipment. SPACEPORT NEWS Nov. 29, 2002 Page 7 Many Kennedy Space Center employees have attended biology classes in their lifetime. Now the tables have turned and some of the Centers workforce are contributing to an introductory biology courses curriculum. Brevard Community College captured KSCs biological world for the Around and About Biology course. KSCs episode is one of 14 supplemental presentations that also will be available on CD-ROM and DVD for distance learning. Series creators and BCC professors John Armstrong and Craig Weaver designed the lessons after years of purchasing a video series that didnt meet their instructional needs. According to Armstrong, the purpose of the episodes is to show real-world applications of biology, especially biology  and biologists  in the Central Florida area. We have tried to focus on applications of biology. Many students do not realize there is more to a biology degree than medical and/or forest rangers, Weaver explained. Included in the videos are different types of jobs, working conditions and diversities that are available. We have included interviews with the biologists themselves, highlighting their backgrounds and interests. Instead of students seeing exciting natural events and careers existing only in far away, exotic locales, the episodes clarify that their education can be easily utilized in Brevard County and surrounding areas. Florida Institute of Technology, a wildlife refuge and Marineland are just a few of the other areas portrayed for the series. At KSC, we covered plants in space, vegetation, the effects of carbon dioxide on greenhouses and near the launch area, and the effects of light on plants in space, said Armstrong. The episodes will be aired on WBCC, starting Summer 2003, so anyone with access to the channel can benefit from the course. Each place we visited, people talked about how they got involved in biology and their careers to spark interest in career possibilities, said Armstrong. According to KSC Animal Spaceflight Programs Bioengineer Dennis Chamberland, who served as a liaison between BCC and KSC, the Center benefits from the project as well. As we invite colleges like BCC to this fantastic enterprise, we ensure that there is a group of knowledgeable, interested future scientists and engineers to carry this work ahead, he said. It has always been the Agencys mandate to share our discoveries with the American people. It is so exciting and satisfying to literally watch our work integrated into the teaching of our local colleges and universities. However, I guess one would naturally expect that, eventually, the most awesome scientific story of our generation would ultimately make it to the Workforce Florida. Web-based technologies are expanding Floridas K-20 education and training services, including programs to support the states vital aerospace workforce, said Lt. Gov. Frank Brogan. FSRIs success with the Advanced Learning Environment demonstrates how Florida and NASA can work together to meet common workforce development needs. Floridas relationship with NASA on ALE was established in 2000 when Brogan and Kennedy Space Center Director Roy Bridges signed a cooperative agreement to support aerospace workforce development. Anyone interested in being a mentor and making a difference in a students life can contact Tom Cavanagh at tcavanagh@ fsri.org or 321-452-2653.ALE. .(Continued from Page 6) KSC collaborates with BCC on biology courseclassroom. As far as future collaborations are concerned, the professors are definitely interested in the possibility. We would like to pursue a bit of physiology such as space suits, physical prep, and electron microscopy, etc., said Weaver. Topics totally dependent on NASA. upgrading the fleet to make use of its unique heavy lift capability for cargo for years to come, OKeefe said. NASA is making plans to be able to start flying a new crew return vehicle in the form of an orbital space plane by the end of the decade, he said. The space plane will be designed to be highly maneuverable and for quick processing turnaround time. The concept of an orbital space plane reflects NASAs need to ferry Space Station crewmembers and to ensure that a capability exists to get the crew home if there iss an emergency. The concept will be the immediate objective of SLIs new research efforts. Administrator OKeefe said the Orbital Space Plane is beneficial on several levels. Its based on existing technologies and therefore lowers risk and is more affordable. It will replace the Space Shuttle as the primary crew transport vehicle, freeing the orbiter fleet to focus on heavy cargo delivery. SLI would continue to identifyBudget. . (Continued from Page 1) future reusable launch vehicle technology through a new Next Generation Launch Technology program, in coordination with national security agencies, investing money in propulsion, structures and other key areas. Details of the Presidents budget amendment are available on the Internet at: http:// www.whitehouse.gov/ news/ At left, a BCC crew films KSC scientist talking about a CO2 experiment and its effects on scrub oaks. Below left are BCC professors John Armstrong and Craig Weaver. Page 8 SPACEPORT NEWS Nov. 29, 2002 Managing editor. . . . . . . . . . . . . . . . . . . Bruce Buckingham Editor. . . . . . . . . . . . . . . . . . . . . . . . Kathy Hagood Production editor. . . . . . . . . . . . . . . . . . . .Anita Barrett Editorial support provided by InDyne Inc. Writers Group. NASA at KSC is located on the Internet at http://www.ksc.nasa.gov Spaceport News is an official publication of the Kennedy Space Center and is published on alternate Fridays by External Relations and Business Development in the interest of KSC civil service and contractor employees. Contributions are welcome and should be submitted two weeks before publication to the Media Services Branch, XA-E1. E-mail submissions can be sent to Katharine.Hagood-1@ksc.nasa.gov John F. Kennedy SpaceSpaceport News Remembering Our HeritageUSGPO: 533-064/600021You may have seen Apollo 13 in the theater or on video, but until you see Apollo 13: The IMAX Experience, you havent experienced the in-your-face thrills the film has to offer in the larger format. The new IMAX film premiered at Kennedy Space Center Visitor Complex Nov. 13 during a gala event with special guests Apollo 13 Commander Jim Lovell and Flight Director Gene Kranz. A second special event featuring Apollo 13 actor Tom Hanks, director Ron Howard and Commander Jim Lovell was held Nov. 14. Guests at both events enjoyed a screening of the dramatic, true story of Apollo 13. They were amazed at how the huge screen captivated their imagination and made them feel a part of the thrilling story. Lovell and Kranz shared their unique experiences during the nail-biting mission, and how they worked together  Lovell from the damaged spacecraft 205,000 miles away, and Kranz at Mission Control in Houston  to bring the astronauts back to Earth safely. I never said Failure isnt an option. That was a scriptwriters invention, Kranz admitted. The scriptwriter came up with the phrase based on the sentiments Kranz repeatedly expressed to his team during the Apollo 13 challenge. Hanks, Howard and LovellHistoric Mission Apollo 13 captured in IMAX film Mission. . (Continued from Page 1) At the IMAX premiere held at KSC, former astronaut Jim Lovell is joined by Tom Hanks, who starred in, and Ron Howard, who directed the film Apollo 13. The film is the newest attraction at the KSC Visitor Complex. discussed the making of the movie and their thoughts about the space program. Howard admitted to being swayed to make the movie closely follow what really happened. My feelings about how the story should be told in the movie changed when we met with the astronauts and actually heard their story  the human interest/human emotion, Howard said. Its amazing what people can do/ accomplish through sheer will. Apollo 13: The IMAXExperience is the newest attraction at the Visitor Complex, airing daily at 3:30 p.m. and included in regular admission to the complex. The Visitor Complex is currently the only IMAX theater in Florida showing the film, which debuted nationwide in September. Apollo 13 is the first-ever 35mm live action film to be digitally re-mastered into IMAXs 15/70 format, which is 10 times larger than a conventional 35mm film and three times larger than a standard 70mm film. Hanks, Bill Paxton and Kevin Bacon star as Apollo astronauts James Lovell, Fred Haise and Jack Swigert, who found themselves in a life-or-death race back to Earth in April 1970 after an oxygen tank ruptured on their Service Module three days into their lunar mission. The great thing about doing this movie in IMAX  it gives us a huge opportunity to let people see it years from now  whole new generations can know the story of Apollo 13, Hanks said. The first IMAX movie, To Fly, is still playing around the country today. Budarin and Donald Pettit. Payload on the mission includes the first port-side truss, P1, to be added to the Space Station. The launch had been postponed from Nov. 11 when two technical issues surfaced, requiring extensive analysis and evaluation. First, a leaking oxygen flex hose was found during Endeavours first launch attempt. Analysis of the leaking flex hose showed the cause to be fatigue from normal use coupled with a weak configuration that allowed excessive flexing of the lines. The oxygen line and a similar one that carries nitrogen were replaced. Second, during the investigation of the oxygen flex hose, Endeavours robotic arm was bumped by a work platform being installed in Endeavours payload bay, resulting in about a two-inchsquare bruise to its carbon composite structure. Tests in Toronto, Canada, along with other analysis, showed that damage to the arm would not affect its operations during STS-113. Shuttle managers on Nov. 20 cleared Endeavour for launch on mission STS-113, resolving both issues. Endeavour is scheduled to land at KSC after an 11-day mission, returning the Expedition 5 crew to Earth.